It's the start of the month again and the monthly donation item has switched to the Marking DNA Changer. This will let you choose the marking genetics for your dinosaur and set them to any which one you want! I am also currently fighting with my host over a problem with emails that the Exhibited server is facing at the moment. I'll update more when I know, but a fair few email providers are currently unable to receive email from Exhibited - so if you're experiencing problems, the best thing to do would be to shoot us a message over the Exhibited facebook. On another note, if you could put your vote in with the latest poll, that would be super helpful! It's one of our mods' birthdays today! To celebrate, you can pickup a Tartan Stegosaurus Plush from the collectibles store today. * Using a food item from inventory will now allow you to feed any dinosaurs that are hungry, not just dinosaurs that have that food assigned. * You can now preview private messages before you send them. Insta-Hatch, New BG & Easter! The monthly item has changed! This month we have the Yellow Egg Cosy, which will automatically hatch an egg into the gender of your choice. We also have a new background! This one is uber pretty and can be found stocking regularly in the Background Store. Hey guys! Things have started getting a bit laggy here so this is just a prompter to let you all know that we're upgrading to a better server, and will be having some downtime at some point this weekend. I'm not expecting it to be for *too* long, but unfortunately it will mean regenerating your dinosaur's images again! Terror Plushies & New Cup Game! Also, the terrorbird plushies have made their way here! As a reminder, the terms of service applies to ALL aspects of the site - shoutboxes included. Swearing is not permitted in shoutboxes and neither is RPing - please stick to the designated RPing areas if you wish to roleplay. Moderators will be removing RP posts from shoutboxes from midnight EX time tonight, so please save logs if you want to hold onto them. * Acrocanthosaurus has been shifted into the scale shop. * A new item is also in the scale shop - the "Note from Mom". This is the item that will reset your dinosaur's trial speciality. That's right! The first of the Big Six are here - the Phorusrhacos! 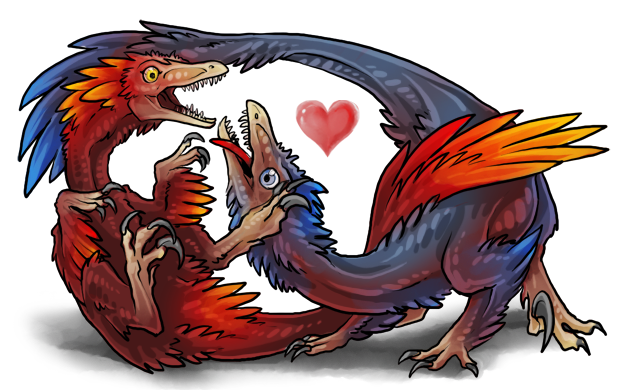 (Otherwise considered the 'terrorbirds' ;D). These will remain as the donation item for the entirety of this month and then be retired, appearing in the scale shop twice a year. These species have gender different images - with the males having more decorative feathers to impress their mates! Meanwhile, the Valentines results are in and prizes have been given out! 1st) Siren (#24019) with 1633 eggs! Siren gets a sack of Herbifertile, Chocolate Oysters, 30 scales and a Terror Egg! 2nd) Sammei (#243) with 1462 eggs! Sam gets a sack of Herbifertile, a Terror Egg and 10 scales! Two Runners Up) Priestling (#24466) with 1010 eggs and Dragranzer (#17687) with 905 eggs -- who both get chocolate oysters! It's time for the Valentines event! Same rules as last year - get a species generated, find items for them and get them to breed! Good luck everyone! Drawn for us by the lovely Xy! Acrocanthosaurus can be made by using the Glowing Yellow Rose item on one of your lab created dinosaurs. It's also the donation item this month!